My (Nandita) battle with tuberculosis (TB) started during my first year of college. Over a period of eight years, I was diagnosed with intestinal tuberculosis, twice. This is a rare type of extra-pulmonary tuberculosis that causes acute stomach pain, fever, vomiting, and rapid weight loss. I underwent six surgeries to remove the infected portion of my intestine, and endured multiple medicines including month-long courses of painful injections. Just days after my 24th birthday, I became deaf, a vicious side effect of the injections. For the longest time, my doctors advised me to hide my illness. “It would hurt and hamper my personal and professional future,” I was told repeatedly. When I first began to speak about my illness, the one question that was always thrown at me, without hesitation, was, “Who will marry you?” I had been tainted with the stigma of tuberculosis. Although men are more susceptible to developing tuberculosis, women are more vulnerable to its social consequences. 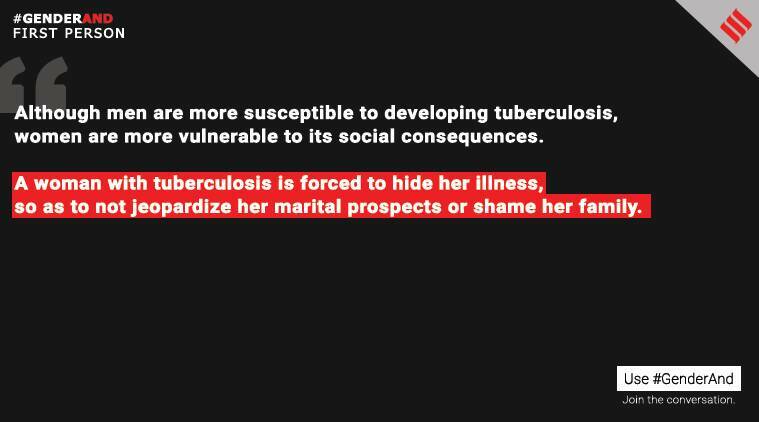 A woman with tuberculosis is forced to hide her illness, so as to not jeopardise her marital prospects or shame her family. While undergoing tough treatments and medical interventions, she is more hesitant to seek solace from others. A man may worry about his infection but he will not worry about being abandoned. He will not hesitate to tell his family, and receive their full support during treatment. A woman, on the other hand, is more likely to suffer an outright act of rejection. Her trauma will not end with cure. There have been numerous recorded cases where women diagnosed with tuberculosis are abandoned and blamed for endangering the health of her family. The fear of this real aftermath may mean many continue to suffer in silence. Tuberculosis is the leading infectious disease killer of women between 15 to 29 years old, and causes more deaths in women compared to HIV/AIDS, malaria and maternal conditions combined (Causes of Death statistics 2010-2013, by the Registrar General of India and Centre for Global Health Research). Five per cent of women in rural areas and 6.5 per cent of women in urban areas die from TB and in both areas women are far more likely to die from tuberculosis compared to men. Tuberculosis is one of the oldest known infections. While the causative bacteria was discovered by German scientist, Robert Koch, in 1882, traces have been found in Egyptian mummies dating as far back as 5000 years ago. The modern era has seen tuberculosis fall from a disease that was once romanticised, the subject of novels and theatre, to one that is intensely undesired. Today, tuberculosis invokes images of dirt and poverty. But it is easily spread through the air and can infect anyone. In fact, over 2.8 million Indians develop tuberculosis each year and more than half a million die. Tuberculosis has a long dormant period. In other words, if a person becomes infected, the bacteria can be dormant in her or his body for a long time without affecting the persons’ health, and in most cases forever. Changes in the body’s immune system, the environment, and a host of unknown factors can wake up the bacteria and activate the disease –chronic cough, night sweats and weight loss are the most common telltale signs. Tuberculosis is curable, especially if it is diagnosed early. But diagnosis carries an enormous social cost for women, as we see in the stories of Pooja and Nandita. Treatment is tough and sapping. Among other side effects, the drugs can cause skin darkening, hair loss, confusion, depression, and hearing loss. These effects – many of which remain long after official ‘cure’ – are worrisome to women who live in a society that already has little empathy for the disease. Thus many women delay visiting the doctor for symptoms they fear to reflect tuberculosis, keep their diagnosis secret, surreptitiously take their medicines, or stop once they feel better even if this threatens their health. Discovery would be a far worse fate. Women, who privately reach out to me, often enquire about crucial, yet stigmatised aspects of the disease that they hesitate to ask their doctors or caregivers – whose focus is fixed on curing the disease and not entirely on healing. “How does tuberculosis affect their sexual health, what should they do about irregular menstrual cycles due to some medicines, how can they handle insensitive taunts from relatives?” are some of the common concerns. However, there is hardly any counseling to assist these aspects or dispel fears. So, through their lived experiences, I and other survivors who have battled tuberculosis successfully, are beginning to rally forces, bridge the information gap and offer strength to peers who have to navigate India’s complex and unforgiving health (and social) system. They are attempting to disrupt prevailing negative stereotypes of the disease – from ones of shame and silence to that of strength and courage. Doctors, families, fiancées and friends, the next time you hear of a woman with tuberculosis, consider for a moment the suffering she might experience over and above her clinical disease. Once she begins treatment, she is not contagious. And if she is supported, she is far more likely to keep taking those medicines and conquer the disease. 1 So women reach the top of companies. What happens after that? 2 Why women might be opting out of the Pradhan Mantri Kaushal Vikas Yojna?